The New York Green Advocate: Is It The End of the Line for Our Love Affair With Sushi? Is It The End of the Line for Our Love Affair With Sushi? Fishavores beware. Your love obsession with sushi and seafood might very well be causing the fish you love to eat to go extinct. 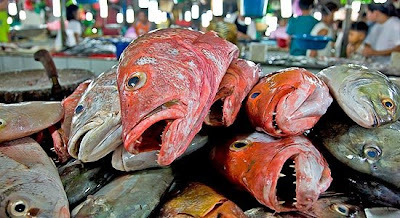 The huge increase in demand and prices for seafood and sushi in particular is paralleled by growth of large scale industrial fishing operations that are literally driving entire species or marine life to extinction. The powerful new film "The End of the Line" is based on the book of the same name by Charles Clover. It's a kind of "Omnivore's Dilemma" (Michale Pollan's book) for the sea - showing us that, like the damage to the earth caused by large scale industrial farming, industrial fishing has not been a friend of the ocean. "The End of the Line" and the recent film "Food Inc" point out that how we harvest food from land and sea are both connected. And, how we have come to expect to feed ourselves from the sea, like on land, is essentially unsustainable. Scientists predict that if current ruthlessly efficient, unsustainable fishing practices continue, we will see the end of most fish life in the ocean by 2048. This should be no surprise considering that in the 19th century whales almost became extinct do to over fishing in the mad rush for whale oil -- America's first oil industry.